First things first: if you have positions open during a holiday and/or a weekend, it’s best not to touch them. Also, if you don’t have positions open during a holiday/weekend, it’s best not to open any positions (unless you know what you are doing). Cryptocurrencies are an oddity in any traded market: they never close. And because of that, the volatility and price action can be random and unpredictable. In fact, sometimes the best choice during the weekends/holidays is to not trade and go enjoy the weekends and holidays. 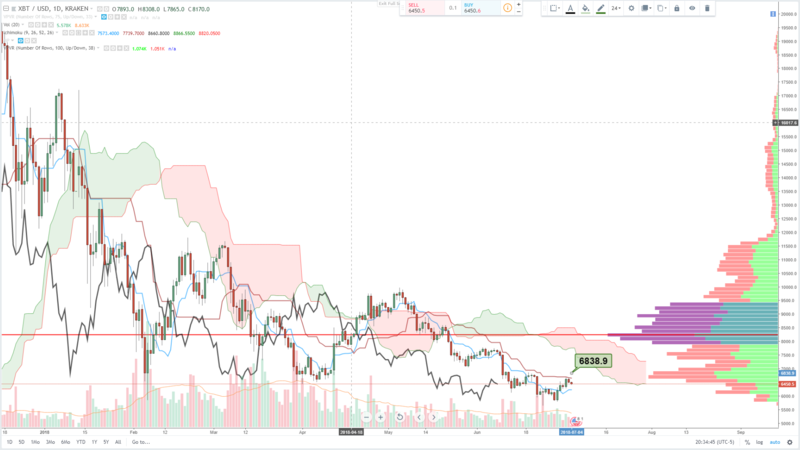 Now, let’s take a peak at the important levels coming up using the Ichimoku system. This is the daily chart of Bitcoin, and it’s showing some early signs of some bullish change. Firstly, Bitcoin is currently trading above the Conversion Line (blue line) and has held there for the past five trading days on increasing volume. Secondly, the Lagging Span (black line) is approaching the candlesticks. What is of particular interest is the Lagging Spans proximity and the price action. There is no doubt that there is evidence of a bottom and reversal forming in Bitcoin and the entire cryptocurrency market. Knowing this, we can anticipate the current price action to move higher with greater ease and even cross above the Base Line (red line). This would provide sufficient conditions to see the Lagging Span cross above the candlesticks and forming a very early bullish signal that we would be entering a new bull phase on the daily charts. Additionally, the volume profile goes from the date of the all-time high to now (July 3rd, 2018). That red horizontal line represents the VPOC (Volume Point Of Control). Think of price being attached to that level by a rubberband: the further price moves from the VPOC, the more it wants to snap back to the VPOC value area. The key area here is the 6800 value zone.